A senior politician in the north of Ireland has been identified as the recipient of a giant payoff as part of a billion euro property deal which could threaten the continued functioning of the Stormont administration. Claims that more than 7 million pounds have been diverted to a bank account in the Isle of Man have been raised in the Dublin parliament by independent TD Mick Wallace as he questioned the controversial sale of assets held by the National Asset Management Agency (NAMA), the so-called ‘bad bank’ set up in the 26 Counties in the wake of the 2008 banking crisis. Mr Wallace focused in particular on the acquisition last year of assets in the Six Counties which had been valued at 4.5 billion euro. 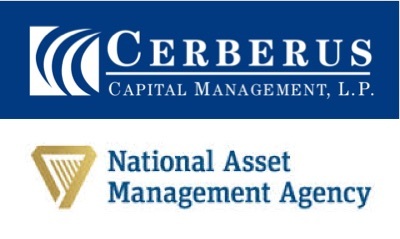 Cerberus Capital Management, a New York vulture fund, purchased the assets at a 70% discount in a deal which the TD said had resulted in “a massive loss for the Irish taxpayer”. The seven million pounds, about ten million euro, was “reportedly earmarked for a Northern Ireland politician,” he said. Mr Wallace was urged by the Ceann Comhairle [Speaker] Sean Barrett not to “make cases against people who are not here to defend themselves”. There have been serious concerns around aspects of NAMA’s activities deal for some time. As a consequence of the decisions of successive Dublin governments following the economic crisis, bad bank debt was turned into public debt with citizens taking on the financial burden of debts amounting to over 64 billion euro. NAMA was intended to recoup the losses to the Irish taxpayer, but has instead engaged in controversial nine- and ten-figure ‘firesale’ deals in the face of rapidly rising property values. The latest allegation that the Cerberus deal may have financially benefited an individual politician or party has raised the stakes to a full-blown political crisis. There are reports this weekend that thirty hours of taped conversations, recorded over a period of several months, could expose how the offshore fund was set up as a political pay-off. The recordings are currently held by a legal firm in Belfast. Party leaders have voiced their concern, distancing themselves from the claims and calling for an investigation. DUP First Minister Peter Robinson moved to publicly deny any link to the scandal after Ulster Unionist leader Mike Nesbitt called on party leaders to come forward and say they were not the intended recipient of the money “for the avoidance of doubt”. But in April last year, the Stormont First Minister said he had spoken to NAMA chairman Frank Daly and former US vice-president Dan Quayle, chairman of Cerberus’s global investments division. At the time, he enthusiastically welcomed the purchase by Cerberus of the NAMA loans as “excellent news for the Northern Ireland economy”. Sinn Fein Deputy First Minister Martin McGuinness was among the many senior political figures who called for an investigation into Wallace’s claims. “That investigation needs to begin immediately and I would encourage Mick Wallace to speak to An Garda Siochana and the PSNI as a matter of urgency,” he said. In a response to the controversy, NAMA said it was satisfied that the sales process for the north’s loan portfolio “delivered the best possible return”. But Brian Rowntree, a Nama advisory board member, said there had been a “wall of silence” at NAMA surrounding the sale of the northern property loan portfolio. The former head of the Housing Executive said he had felt “excluded” and expressed concerns but was told the matter was “commercially sensitive”. Sinn Fein leader Gerry Adams said his party’s specific warnings about the deal in question had been ignored. Cerberus has denied making any improper payments. The PSNI said nothing had been reported to it regarding the claims, and “as such there is no investigation”. The controversy comes at a very bad time for the Stormont administration as it struggles with the failure of last December’s Stormont House Agreement. That deal was intended to tackle issues such as flags, parades, victims and historical investigations, but fell apart in recent months as the details of proposed welfare cuts became clearer. In order to avoid a immediate collapse, the Stormont parties have approved a temporary arrangement on the North’s finances which skates around the welfare issues. The arrangement has been variously described as a ‘pretend’, ‘phantom’ or ‘fantasy’ budget, as it was drawn up on the pretence that welfare reform has already been agreed. This week, before news of the latest controversy emerged, Sinn Fein had again warned that the North’s institution are “hanging by a thread”. “Sinn Fein cannot and will not be agents of cuts imposed on citizens in the north at the behest of millionaires in London,” Mr Adams wrote this week. But any suggestion that the North’s politicians have corruptly received millions of pounds of public money, even as deep cuts are being made to social services and welfare supports, could come as the final blow to Stormont’s credibility.